Talk about a complete reversal. While last week’s episode can undoubtedly be considered one of the anime’s worst, the opposite holds true for this week’s episode. Episode 20 is straight up solid and a clear step ahead of the past few episodes in terms of art, animation, direction, and overall quality. There are very few dull moments in the episode, and as an introduction to Haru’s arc, it’s very promising. 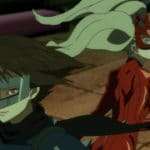 So let’s get this out of the way first: the Okumura arc in the game was…flawed. Plot contrivances, tedious dungeon progression, shaky writing were just some of the reasons why I personally didn’t enjoy this arc as much as the others. I’m not going to say the anime completely fixed everything that was wrong here, but it undeniably improves on the source material in a way that makes it clear that the anime team was aware of some of the common criticisms directed at this arc. 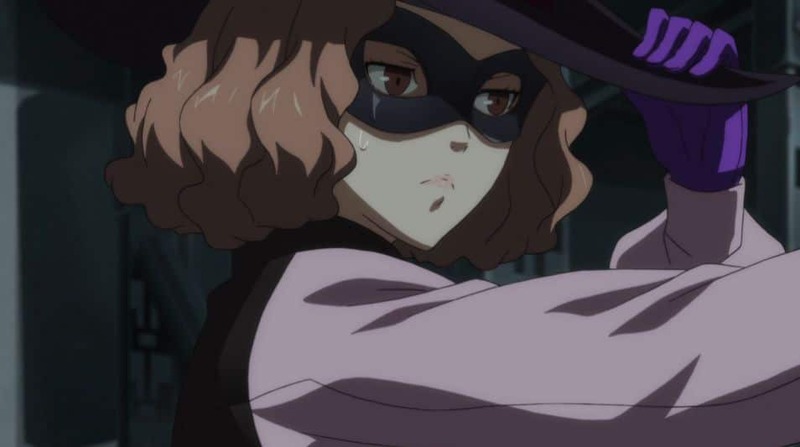 Take Haru’s entire introduction as a Phantom Thief, for example. It was kind of funny and kind of interesting, but the novelty wears off and her gimmick becomes a bit tedious. The anime plays it up for all it’s worth, and it’s stellar from beginning to end. 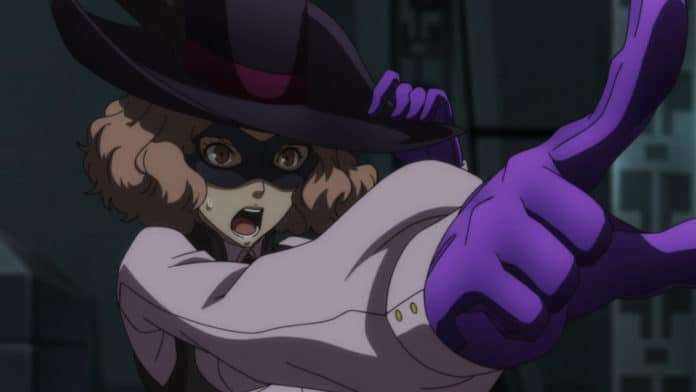 There are genuine laughs to be had here, and Haru’s entire dynamic with Morgana is just solid. 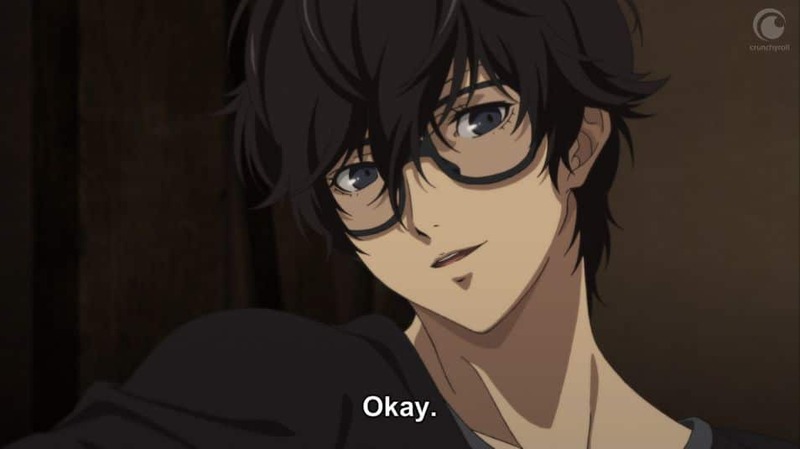 There’s a level of intimacy between the two that doesn’t exist in the game, as the game mostly sticks to Ren’s perspective, while the anime shows us a bit of Haru and Morgana’s private conversations. There’s a lot the anime capitalizes on here, and I appreciate how it doesn’t really waste the viewer’s time with long, drawn-out scenes. The game has the perfect example of this with a scene in which the Phantom Thieves try to search out Haru’s identity at the school. It’s… not great, by any stretch. The anime, meanwhile gets right to the point, cutting straight to the Phantom Thieves grilling Haru for info in a scene that’s both delightful (I really appreciate the anime’s decision to have all of the Phantom Thieves be present here) and tense. Haru’s characterization isn’t the only thing that was improved in the anime. 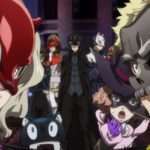 One of the biggest low points in the game, Morgana’s conflict with Ryuji, is completely revamped from the ground up, and entirely for the better. The original plot point was just bad all around. There was just this combination of plot contrivance and cruelty that really made it unpleasant to play through. Now, to be clear, I’m not talking about the inciting incident. It’s natural to have two hard-headed individuals lash out at each other and say things they didn’t mean to say. 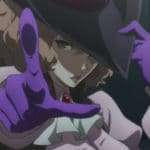 It’s what happens afterwards that’s the problem, where the Phantom Thieves half-heartedly chase after Morgana and ask him to rejoin, only for Ryuji to ruin it by making a jab at Morgana’s expense at the worst possible time. This is terrible for so many reasons, but I think what made that scene hurt was how much it conflicted with Ryuji’s overall character. He might be a stupid, vulgar idiot with a penchant for yelling at inopportune times, but he’s also a pretty selfless guy, and the kind of guy to look out for others. It’s something we see early on when he assuages Morgana of his insecurities in the Kamoshida arc. Having him be this disaffected and cold about Morgana’s insecurities is just awful, and arguably a huge betrayal of his character. The anime completely undoes this. 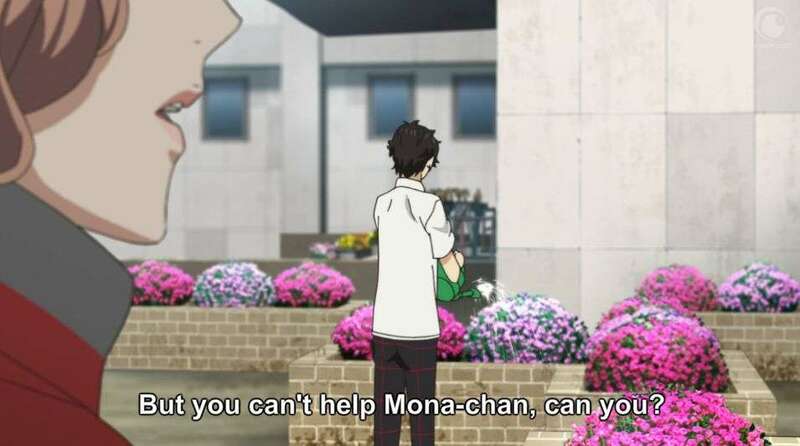 When the group reunites with Morgana, Ryuji immediately tries to apologize to Morgana, awkwardly spilling his heart out and almost succeeding at convincing Morgana to come back, only to trip up and accidentally offend him. It’s a significantly better scene all around, to the point where it makes the original scene look like a bad joke. 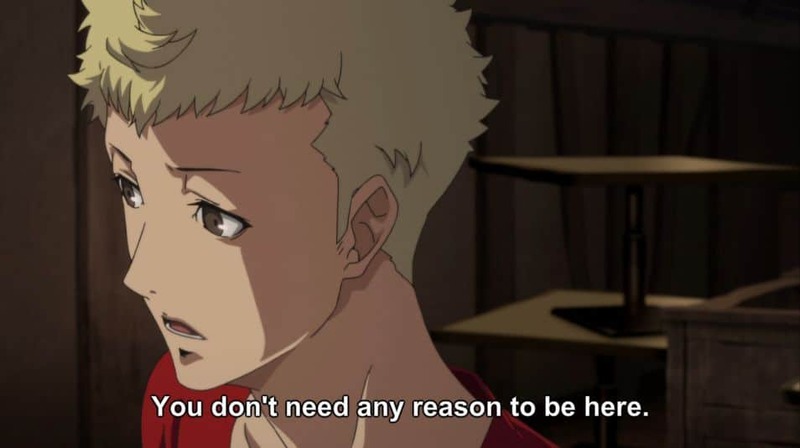 Things come to a head when Ryuji ends up apologizing for real, with a scene that ends up being one of the most heartfelt and emotional moments in the anime so far. I’m not embarrassed to admit that I started getting misty-eyed during it, and it astounds me that the original game never opted for this emotional payoff. It’s such a significant moment in Ryuji and Morgana’s respective character arcs, and the game doesn’t do anything with it. If there’s any criticism to be made for this episode, it’s Ren. He’s the only real holdout as far as satisfying character moments go, having slinked back into being complete non-character for the most part. He doesn’t really come across as a leader at all, and his bond with Morgana was barely given a focus (something even the game manages to get right). When he speaks, it feels more like the anime is trying to remind us that he’s there, rather than him actually contributing to anything. I also felt that Haru’s fiance is as cliche as ever, and his utter lack of depth just makes him less interesting as an antagonist. That said, neither of these points detracts from a stellar episode, which was a triumph overall. While it’s entirely possible the show might relapse into mediocrity due to shaky production, I’m still holding out for this level of quality being the norm from here on out.